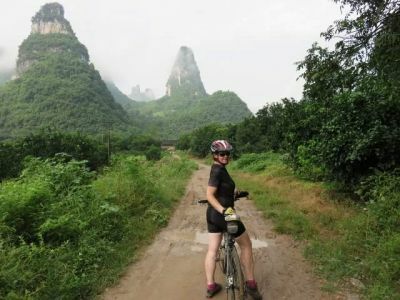 I had an amazing time cycling through spectacular scenery with a great group of people. Being "lost in time" was of the most amazing experiences of my life. The cycling was nearly as amazing as the people I shared it with and the team that led us. It was challenging at times being the wet season but to anyone who is considering this tour, stop considering and just do it! 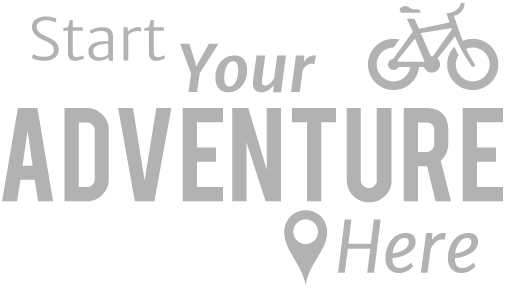 You won't regret it; I am so pleased I took the leap. Ken and the crew will take fantastic care of you and you will have the time of your life! 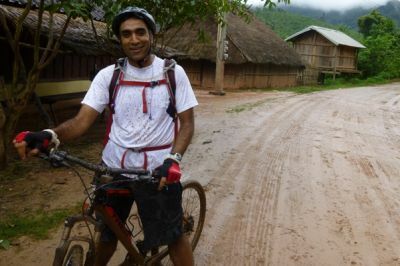 The people of Laos are some of the nicest you will ever meet and your fellow cyclists will become friends for life. A truly enriching and life-affirming experience. I just wanted to say what a fantastic time I had on the recent Thailand - Laos trip! From the beginning and booking with Elisabeth and Bryony through to the actual tour itself has been brilliant. The team in Laos are fantastic! Ken, Mae (and Manniwan), Lid and Ton really made the trip. It was so special travelling with the local team and I wouldn't change a thing about the organization of it. I trusted Ken and Lid 100% when it came to making decisions on roads and when to ride/not to ride. They are true professionals. Lid was also fantastic when it came to the bike maitenance and I know as I had a few dramas! Nothing major, just all the mud etc taking its toll, but every time something did happen I knew Lid was there to fix. Ken and his fabulous sense of humour always kept us laughing! Mae, what a fabulous cook she was and such a delight to have around. Manniwan (their daughter) was also a delight and I thoroughly enjoyed having the chance to spend time with her as well. Ton was so patient and always happy! He did a great job driving the bus and was always there waving "sabaidee" as we got to the bus. I loved every minute and every kilometre of the journey. Overall, the organization was perfect. 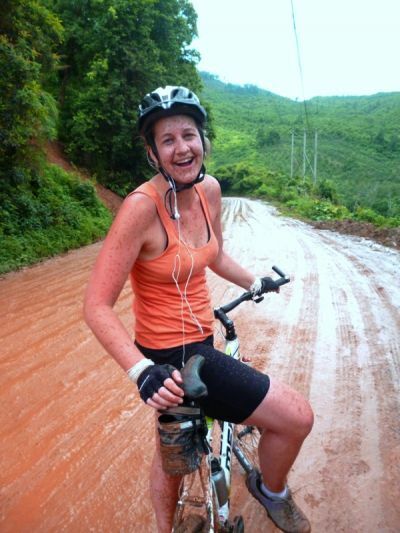 The length we rode each day and the towns we stopped in (including the rest day in Luang Prabang) was spot on. Having the local team and their knowledge made the trip! Thank you to yourself and all of the team involved at redspokes for making this the best trip of my life. I will certainly be doing more redspokes tours in the past and I have (and will continue to) spread the word over here in Melbourne! Considering that we went in the wet season, were able to see everything we expected and hoped to see. We both felt that it was actually a good time to visit Laos. Everything is really green and lush and it was really good to see people working in the rice fields and to get a good feel for what their lives are really like, much better than just looking at empty scenery. The home stay was a real highlight and we were both really moved by the sincerity of the villages towards us. Ken and all of the rest of the support team were absolutely excellent, it definitely wouldn't have been the same without his good humour, he made all the right decisions about when to ride and when not to, his experience on the route is invaluable. We both thought that his obvious love of his wonderful country and its people shone through. I'd also like to mention Alan too who looked after us in Thailand. He was an excellent bloke, I was staggered by his achievements and modesty. 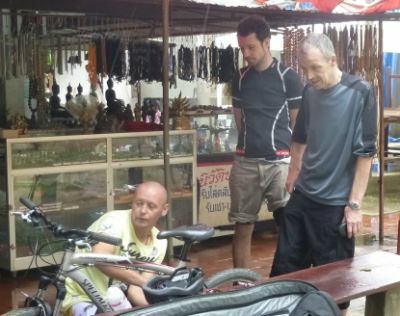 I really hope that all goes well for him with the Northern Thailand tours. I'm sure that all who meet him will be impressed, how couldn't you with a Guinness world record under his belt! For my son and I this was a wonderful and at times quite magical trip and just so glad that we were able to make it. We are now considering where to go next, we both want more. Thanks again to you all and we both look forward to many more happy cycling miles.